Describe a user account and the type of information it contains. Add a single user or multiple users. 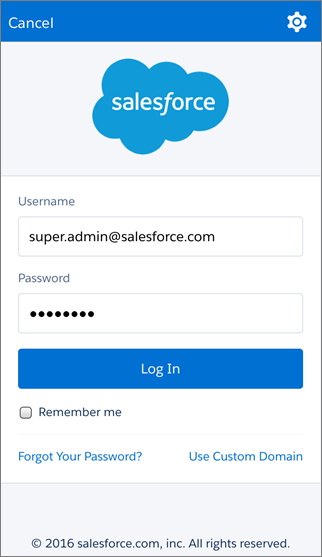 Use the Salesforce mobile app to manage users on the go. As a new administrator, you perform user management tasks like creating and editing users, resetting passwords, granting permissions, configuring data access, and much more. In this unit, you will learn about users and how you add users to your Salesforce org. So what is a user? A user is anyone who logs in to Salesforce. Users are employees at your company, such as sales reps, managers, and IT specialists, who need access to the company's records. Don't worry if all that sounds unfamiliar. We cover it in more detail later. View a user's detail page by clicking the name, alias, or username. Log in as any user if the system permission is enabled or if the user has granted you system administrator login access. We've thrown many terms at you as we've described the background information you need to get started adding users. Here are some key terms you should know and their definitions. Each user has both a username and an email address. The username must be formatted like an email address and must be unique across all Salesforce organizations. It can be the user's email address, so long as it is unique. A user license determines which features the user can access in Salesforce. For example, you can allow users access to standard Salesforce features and Chatter with the standard Salesforce license. But, if you want to grant a user access to only some features in Salesforce, you have a host of licenses to choose from. For example, if you have to grant a user access to Chatter without allowing them to see any data in Salesforce, you can give them a Chatter Free license. Profiles determine what users can do in Salesforce. They come with a set of permissions which grant access to particular objects, fields, tabs, and records. Each user can have only one profile. Select profiles based on a user’s job function (the Standard User profile is the best choice for most users). Don’t give a user a profile with more access than the user needs to do their job. You can grant access to more items the user needs with a permission set. Roles determine what users can see in Salesforce based on where they are located in the role hierarchy. Users at the top of the hierarchy can see all the data owned by users below them. Users at lower levels can't see data owned by users above them, or in other branches, unless sharing rules grant them access. Roles are optional but each user can have only one. If you have an org with many users, you may find it easier to assign roles when adding users. However, you can set up a role hierarchy and assign roles to users at any time. Roles are only available in Professional, Enterprise, Unlimited, Performance, and Developer editions of Salesforce. An alias is a short name to identify the user on list pages, reports, or other places where their entire name doesn't fit. By default, the alias is the first letter of the user's first name and the first four letters of their last name. You have many options for adding users and many tools at your disposal in Salesforce. Here are some guidelines to help you get started. Enter each user's name, email address, and a unique username in the form of an email address. By default, the username is the same as the email address, but you can overwrite this. Now you've learned how to add users to your Salesforce org. In the next unit, we teach you how to keep your data safe by configuring what your users can access. Access to user management and Setup isn’t limited to the desktop. 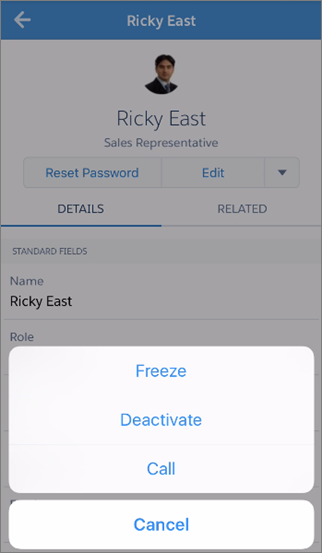 If you’re not at your desk and you need to get your admin duties on, you can take Setup on the go with the SalesforceA mobile app. You can perform essential admin tasks like resetting passwords, freezing users, and viewing current system status from your mobile device. You can get SalesforceA for iOS and Android mobile devices. Download SalesforceA from the App Store™ or Google Play™. Logging in to Salesforce Mobile App is as easy as pie. You need just a couple of key ingredients to log in to mobile app successfully. The last item is important. The instance can vary from production, sandbox, or a custom domain. By default, the Salesforce Mobile App connects to the production environment. You can connect to a sandbox environment for testing purposes, or a custom domain if configured for your org. When you have all the ingredients ready, you’re ready to log in. 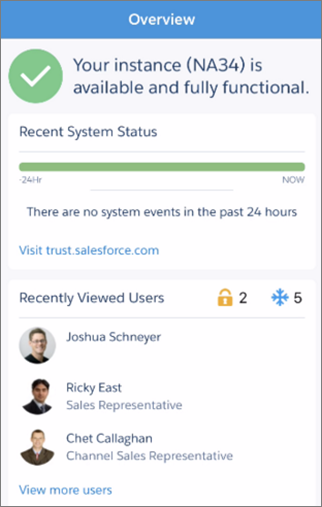 Open the Salesforce mobile app. To log in to sandbox or a custom domain, iOS users tap to select the correct environment. Android users tap to select the correct environment. After you log in to SalesforceA, you see the Overview page which shows the recent system status and recently viewed users. The Recent System Status section shows information from trust.salesforce.com about your instance's system performance over the last 24 hours. Trust.salesforce.com is Salesforce’s website to provide transparency around service availability, performance, security, privacy, and compliance. Trust status gives you a quick and easy way to see if your org performance has been affected so you can let your users know of any changes. Pop quiz: You’re away from your desk grabbing coffee and you get an email saying a user’s Salesforce account may have been compromised. What do you do? Well, because you have SalesforceA installed, you can calmly sip your latte and take care of business from your mobile device. Go to the compromised user’s profile page, then tap and select Freeze. Now the user’s compromised account is frozen to prevent any trouble, and you can get back to enjoying your well-deserved coffee break. You’ve seen what you can do by taking Setup on the go with SalesforceA. You can monitor the trust status of your org or freeze a user whose account has been compromised. When you get back to your desk from your latte break, we’ll dive deeper into what Setup on the desktop can do for you.